This article may upset some of my friends in at energy publications and associations, but we have a problem which people need to be aware of. It is that we can no longer trust awards for energy-saving products as indicators of merit. I get asked for advice about dubious products by my newsletter readers and often they’ll say “I smell a rat but it has an award from [insert name of prestigious body]“. How can something bogus get an award that it does not deserve? To answer that you have to understand how award schemes work. In particular you need to appreciate that their promoters are driven by profit. The commercial imperative is simple: get as many bums on expensive seats as possible at a gala-dinner awards ceremony. To do that, they need to have a lot of short-listed candidates, because those are the people who will pay on the off-chance that they get to pose as a winner with the celebrity host. Having a big shortlist means putting an awful lot of entries in front of the judging panel (44 for one panel I sat on). But these judges are unpaid, and as volunteers they simply cannot spare enough time to scrutinise entries thoroughly, even though some do take it seriously and try to be diligent. They aren’t helped by the fact that candidates often submit little more than rehashed sales blurbs full of unsubstantiated claims — a short-cut which promoters condone in the interests of maximising the number of bums on seats. Some judges, moreover, will have been selected more for their celebrity than their knowledge (celebrity judges equals more bums on seats), and will lack the ability to spot snake-oil propositions or even to understand counter-arguments from more knowledgeable fellow-judges. 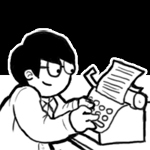 The majority of any panel will be easily swayed by the plausible nonsense in the entries, will not question the credibility of testimonials, and will naively assume that no competition entrant could possibly have criminal intent. It is asymmetric warfare. The snake-oil peddler just needs to keep plugging away with award entries because the spurious credibility that they get from their first award is too valuable to forego. Once they have landed one award, they are effectively immunised against rejection by judges for other awards and probably even have their chances boosted. I don’t want to tar all awards with the same brush: in an honest world they would all work to everyone’s benefit, and no promoter is knowingly complicit in the occasional fraud that slips through the net. But sadly a few bad apples have devalued energy awards and my advice would be this. If you have doubts about a product, seeing the phrase ‘award-winning’ should put you on alert. This kit of parts appears in my latest “Kitchen Table-top Talk” on energy topics. 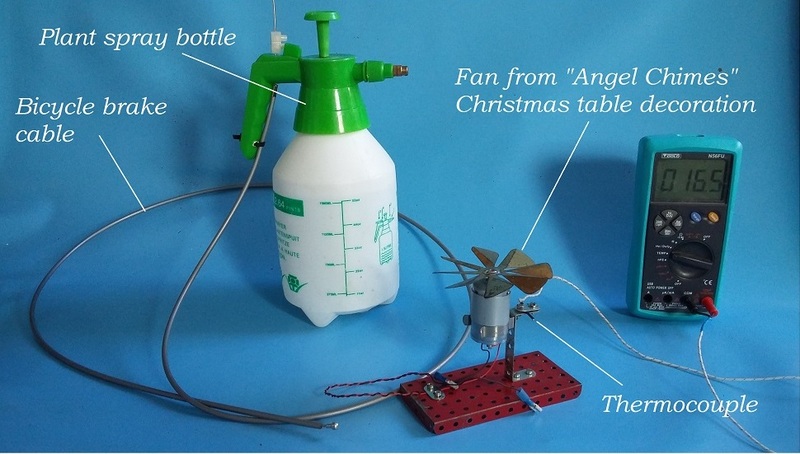 It demonstrates the principle of evaporative cooling, a technique which can reduce the temperature of air in a space without the need for active refrigeration. To view the video please visit my YouTube channel. 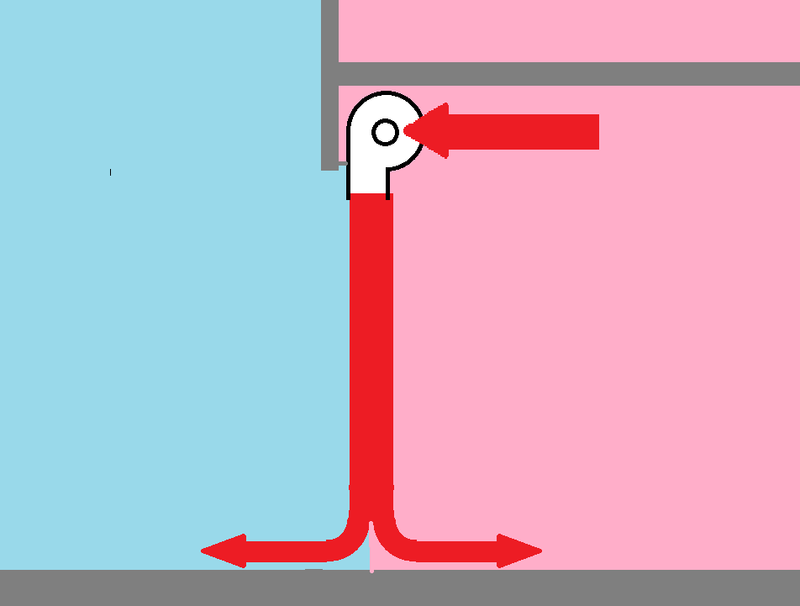 In situations where it is necessary to keep a building’s outer doors open, you will sometimes find “air curtains”, fans which blow a sheet of air down across the width of the doorway. These are an effective way of preventing dust and insects getting in through the door: they are entrained in the outer layer of airflow, and where the jet hits the floor it splits, with the outer layer discharging the contaminants back outside. Some suppliers of air curtains claim that they conserve energy as well. 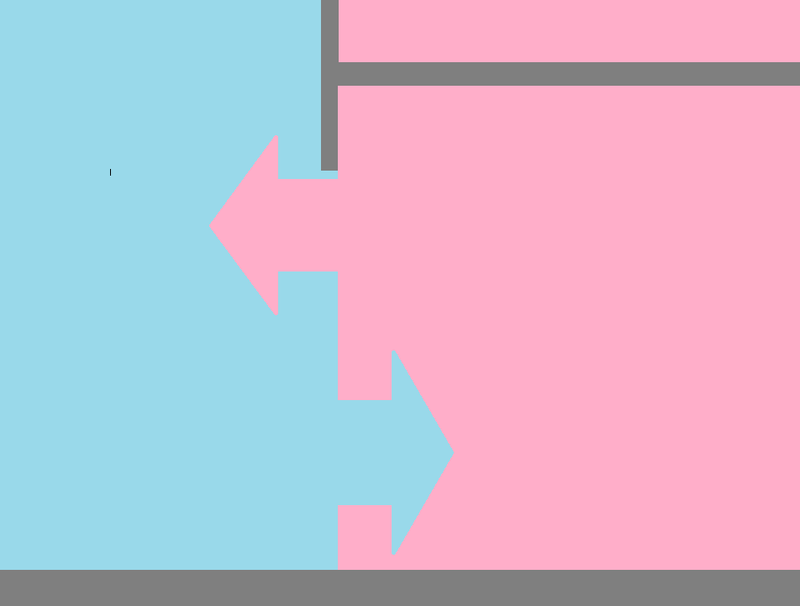 The basis of this claim lies in what would naturally happen in an open doorway in still conditions, namely convective circulation in which warm air at high level flows out to be balanced by cold air flowing inwards at low level (right). This effect will be especially marked with high doorways. 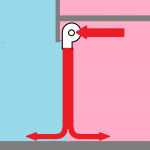 The claim for air curtains is that they disrupt the flow of escaping warm air, forcing it down to floor level where the jet splits, with the warm inner layer returning inside. However, even in still conditions there is a problem here, because the fan is drawing air from high level inside and at floor level only half of it returns inside. 50% of the internal air drawn into the fan is diverted outside when the jet splits at floor level (left). A further problem with pedestrian doorways particularly is that the air curtain usually needs heating to prevent the perception of cold that the air’s velocity would create. If the building actually doesn’t need that heat, it is all a waste of money. Even if it does need the heat, half of what is put in goes straight outside. In windy conditions the argument for air curtains as heat barriers really breaks down. A moving sheet of air is simply not as effective as a door. 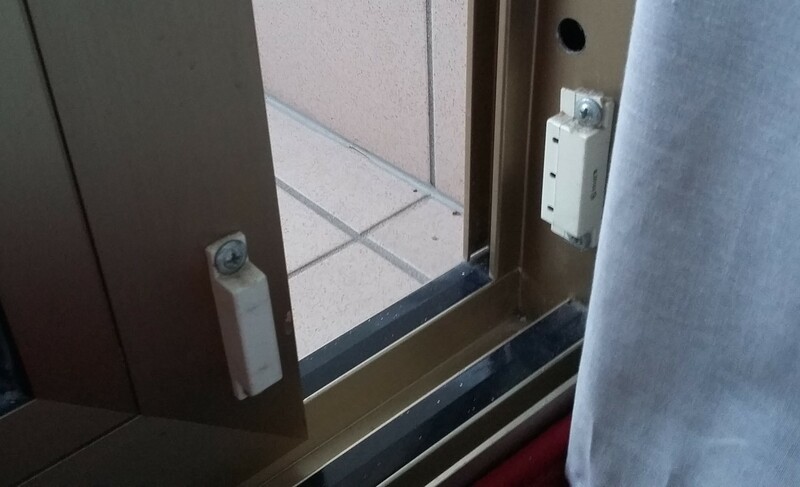 If there is any differential pressure whatever, that sheet of air will be displaced, and the problem is exacerbated if there are open doors or windows on the far side of space – or extract fans. In one instance I visited a restaurant that operated an open-door policy. Their air curtain had a 20kW heater that ran continuously, but the downjet did not reach the floor: about 60cm above the floor it turned inwards along with a layer of cold air at floor level, thanks to the kitchen extract depressurising the space. The exhaust from a natural gas appliance contains about 0.15 litres of water per kWh of gas input, and about a tenth of the thermal output is lost because that water is emitted as vapour. Condensing boilers are a good idea in theory because they can condense the vapour and recover latent heat from the products of combustion, boosting output by around a tenth. In practice, too few condensing boilers achieve their potential because they cannot cool the flue gas below its dew point (around 59C ). Result: plumes of vapour outside. This one resembles what you’d see boiling a 2-3 kW kettle in the open air, and that’s a measure of how much energy is being wasted. The truth is that so-called condensing boilers need to be installed in heating systems with low return water temperatures. Underfloor heating, or systems with oversized radiators for example. Only then will they get sufficiently-low temperatures in their heat exchangers to get the exhaust vapour to condense. It’s like a curse. Waking up last Wednesday to a view of the full moon reflected off the Adriatic in the pale light of dawn, I opened the sliding door to the hotel balcony to take a snapshot. 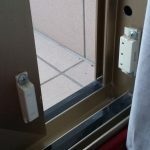 As I did so I heard the air conditioning fan stop and there in the pale light of dawn I saw a magnetic reed switch on the door frame, evidently linked to the fan-coil unit control. “Brilliant” I thought: “a picture of that will be perfect for my session at our conference on energy in hotels”. 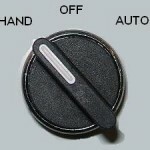 To be fair to myself I did photograph the moonlit Adriatic first and the interlock switch later. Just how big a saving is it possible to achieve with a product which improves heat transfer in a ‘wet’ heating system (one which uses circulating water to feed radiators, heater batteries or convectors)? It is an important question to answer because suspect additives claiming to reduce losses through water treatment are becoming prevalent, making claims in the range of 10-20%, while air-removal devices have been claiming up to 30%. It is possible to show that the plausible upper limit is of the order of 7% and that this would be achievable through good routine maintenance anyway. Unburned fuel (carbon monoxide or soot). Which of these could be affected by water treatment and which would not? Standing heat loss is sensitive only to the extent that the external surface temperature of the boiler might differ with and without water-side scaling. As such losses would only be about 2% of the boiler’s rated output in the first place, we can safely take the effect of variations to be negligible. Latent heat losses would not be affected because they are solely a function of the quantity of water vapour in the exhaust, and that is fixed by the chemistry of combustion and in particular the amount of hydrogen in the fuel. Unburned fuel losses will not be affected either. They are determined by the effectiveness of burner maintenance in terms of air/fuel ratio and how well the fuel is mixed with the combustion air. That just leaves sensible heat losses. Two things can cause higher-than necessary sensible heat loss. One is to have excessive volumes of air fed through the combustion process, and the other is having a higher-than-necessary exhaust gas temperature. Excess air is self-evidently totally unrelated to poor water-side heat transfer, but high exhaust temperatures will definitely occur if the heat transfer surfaces are dirty or scaled up. With impaired heat transfer the boiler cannot absorb as much of the heat of combustion as it should, or to look at it a different way, higher combustion-product temperatures are needed to overcome the thermal resistance. This leaves a net 84.5% as “useful” heat but we should deduct a further 2% for standing losses, giving 82.5% overall thermal efficiency as our benchmark. and this figure of about 7% is the most, therefore, that one could plausibly claim as the effect of descaling a heating system whose boilers are otherwise clean and reasonably well-tuned. In fact if the observed stack temperature before treatment is lower, the headroom for savings is lower too. At 200°C the overall efficiency would work out at 81.4% and the potential savings would be capped at about 3%. Three points need to be stressed here. Firstly, just measuring the flue gas temperature will tell you accurately the maximum that a boiler-water additive alone could conceivably save. Secondly, you cannot be sure the problem is on the water side anyway: it may be fireside deposits. Thirdly, all these potential savings should be achievable just with good conventional cleaning and descaling. The vapour-compression cycle at the heart of most air-conditioning systems consists of a closed loop of volatile fluid. In the diagram below the fluid in vapour form at (1) is compressed, which raises its temperature (2), after which it passes through a heat exchanger (the “condenser”) where it is cooled by water or ambient air. At (3) it reaches its dewpoint temperature and condenses, changing back to liquid (4). The liquid passes through an expansion valve. The abrupt drop in pressure causes a drop of temperature as some of the fluid turns to vapour: the resulting cold liquid/vapour mixture passes through a heat exchanger (the “evaporator”) picking up heat from the space and turning back to vapour (1). The condenser has two jobs to do. It needs to dump latent heat (3->4) but first it must dump sensible heat just to reduce the vapour’s temperature to its dewpoint. This is referred to as removing superheat. 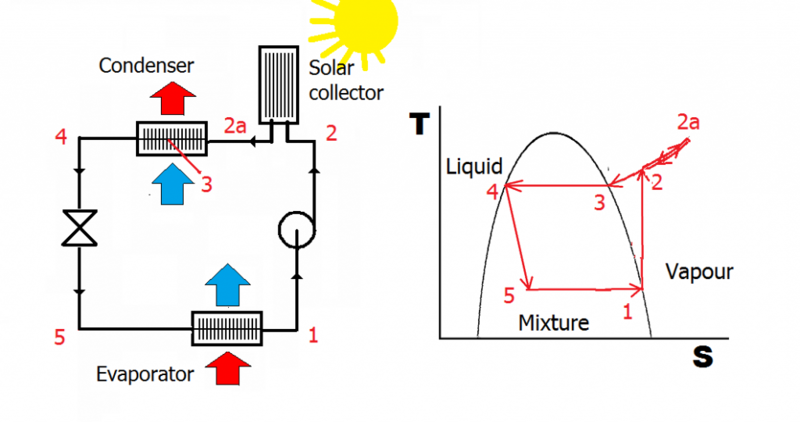 It has been claimed that it is possible to improve the efficiency of this process by injecting heat between the compressor and condenser (for example by using a solar panel). Could this work? The claim is based on the idea that injecting heat reduces the power drawn by the compressor. 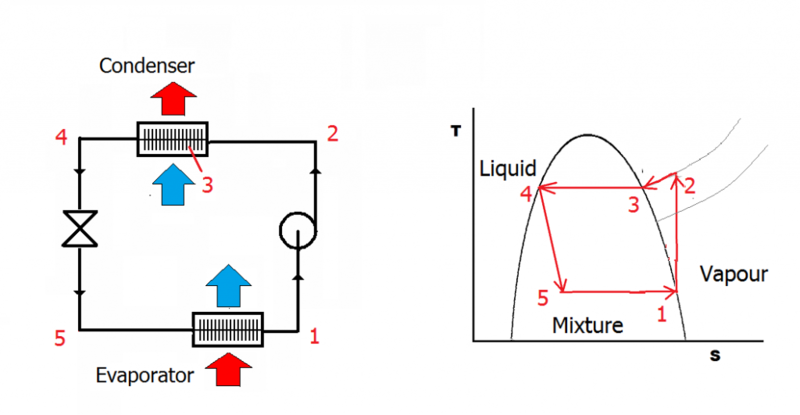 It is an interesting claim because it contains a grain of truth, but there is a catch: the drop in power would be inextricably linked to a drop in the cooling capacity of the apparatus. This is because we have now superheated the vapour even more than before, so the condenser now needs to dump more sensible heat. This reduces its capacity to dump latent heat. The evaporator can only absorb as much latent heat as the condenser can reject: if the latter is reduced, so is the former. 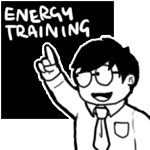 Any observed reduction in compressor power is the consequence of the cooling capacity being constrained. The final nail in the coffin of this idea is that reduced power is not the same as reduced energy consumption: the compressor will need to run for longer to pump out the same amount of heat. Thus there is no kWh saving, whatever the testimonials may say. Proponents of voltage reduction (“optimisation” as they like to call it) have started suggesting that equipment is more energy-efficient at lower voltage. In fact this is quite often not the case. 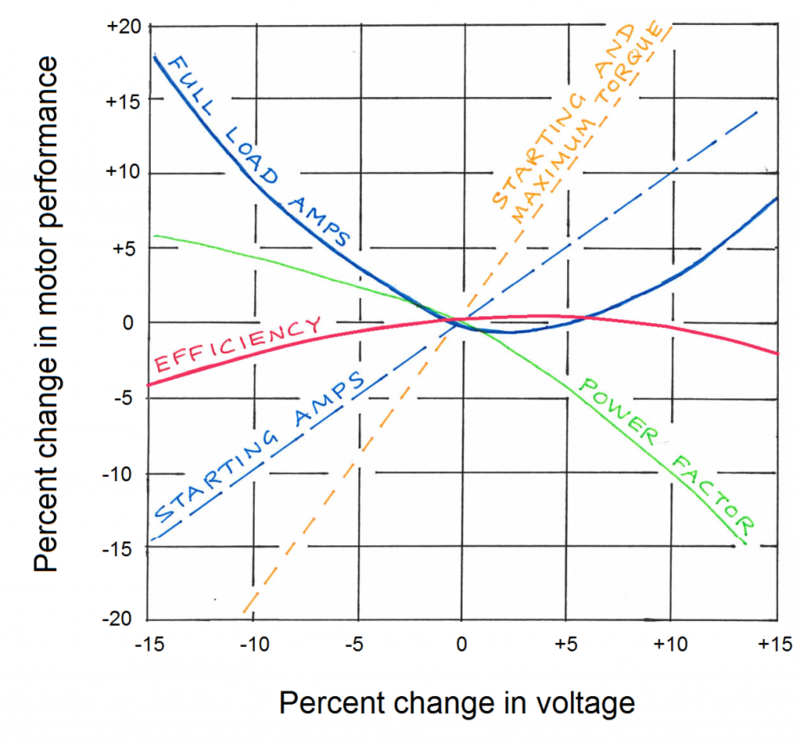 For an electric motor, this diagram shows how various aspects of energy performance vary as you deviate from a its nominal voltage. The red line shows that peak efficiency occurs, if anything, at slightly above rated voltage. Reduced voltage is associated with reduced efficiency. The reason is that to deliver the same output at lower voltage, the motor will need to draw a higher current, and that increases its resistive losses. The striking thing about the plantroom panel switches above is that they lack the ‘HAND’ position that is normally provided to allow equipment to run manually, and which are all too frequently found in that condition (right). If you genuinely need to be able to let people in the plantroom override the automatic control, then at least get your building management system to monitor the switch position to alert you. Otherwise you just end up with stuff running continuously that doesn’t need to. How big is my steam leak? The relatively small amount of vapour from this kettle is taking 2.5 kW of power to sustain it, the equivalent of 21,900 kWh per year. If that much energy were delivered by a boiler at 80% efficiency with fuel at say £0.03 per kWh, it would cost over £800 per year. Now compare this with the size of some of the steam plumes you see around your plant.